First note on alto sax is an F. That means Ab concert, so it’s a Bb on tenor saxophone. 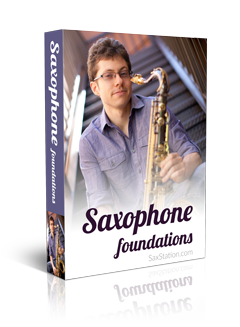 The scale that will help you play this is Db (C#) on alto or F# on tenor sax. If you know that scale on your saxophone, you should be able to play this part easily and the rest of the song if you want to. I suggest you listen to some recordings of alto sax you like and then work on it. If you want my help with that, you can check out Saxophone Tribe or the improvisation class. The same notes or sound the same? How long have you been playing? Do you just need the letter names of the notes or do you need the diagrams? Have you ever learned any music by ear? That might be a good tune for you to start with. Keep up the fabulous and great work, you helped a lot, so thank you. Hi, I want to play “In The Mood” in alto saxophone. Thanks !